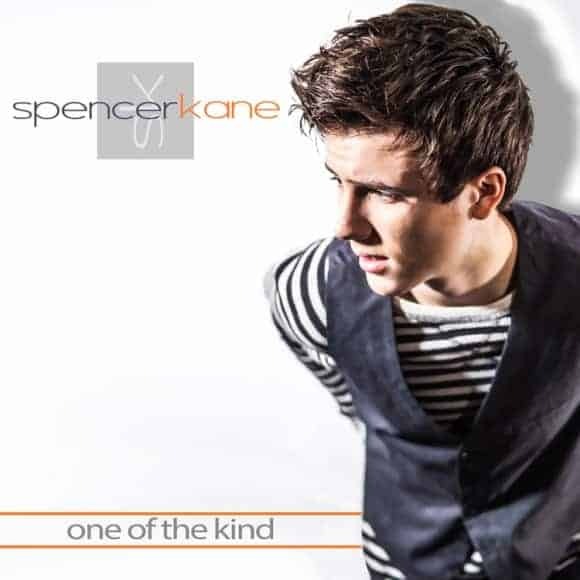 We are very excited to share this interview with rising pop star, Spencer Kane. Spencer began singing at age 5, and has performed his way to a successful music career. His message to kids and teenagers about standing up against bullying is a powerful one that resonates with his generation. First, thank you, Spencer, for agreeing to do this interview. Our Family World is dedicated empowering both parents and children in the fight to stop bullying. It is an honor to have you join us in our special anti-bullying series this month. Thank you for caring about something I know is important to a lot of kids and teens like me. It makes a difference when more people talk about it. You recorded your first music video before you even started first grade, and have been going non-stop since then, building quite a career for yourself. What inspired such a passion for music and performing at such an early age? My parents always listened to music in the car and home and sang to me even as a baby. They were involved in church ministry and music was just a part of things in our home. I sang at church from time to time, but I think the car trips with me in my car seat and dad turning up the music real loud and singing made it “normal”. They used to sing to me and taught me words as young as like 2 or 3 years old. I remember mom and dad laughing cause I couldn’t really understand some words so I would just make some up. Like on a Tobymac CD on one track the words were THESE ARE EXTREME DAYS and I would sing something like DEE-SODDA STREAM DAYS as loud as the music. They would laugh at me. Dad has been a singer his whole life so it made it easier to learn music stuff from him. Dad and I would play a game on the radio where we flip stations and see who can guess the song title or artist before the other and if you did, you get a point. We play to 10. I guess all that music in our home made it seem normal to start singing. I didn’t really do it seriously until 13 years old. So even though we had it in our home, it was more of a fun thing to do and I didn’t really ever see me doing music as a career. I always imagined being a basketball or baseball player. You’ve covered songs from many artists, including Maroon 5, Cody Simpson, and Justin Bieber. Who would you say has the strongest influence on your own personal songs? Well singing those cover songs is kind of how you get people to listen to you. Most people don’t care about your original music as much as whether you sing something they already know. But my personal songs have been more inspired by my faith. Tobymac is my favorite artist and I’ve always loved how he could make a Christian song so pop sounding and I love hip hop and rap music, which he does. So I guess his music has always been a motivation to create good music with a moral message. But I don’t know that any one artist influences my song writing. I guess my dad and I talk about things I go through and I share stuff my friends deal with and that seems to be how I write music. On your website, you talk about how you were bullied at an early age, and how it still continues today. Bullying can take such a serious toll on self-confidence. How did you push through it and still maintain the confidence to go on stage to perform your music? I think the hardest part about bullying is that some people have better support than others. Some kids I talk to that have been bullied seem to not have a strong relationship with their parents or they don’t have a faith belief that helps them cope. I have both, so although I’ve had tough times and have been hurt because of unkind words or actions, my parents and I usually pray about the situation and people involved and it has helped. I know that isn’t always the same for others, but that is what has helped me to not believe what is being said about me. I think self-confidence is tricky. I struggle a lot with letting things get in my head and it shows when I perform, record or even play sports. I guess the hard part is making the choice not to believe the worst in myself and that seems to help me focus on getting better at performing. I know one thing I usually tell kids that write me about being bullied is that they have to be careful to NOT be a bully to themselves. A lot of them say things like “I’m ugly. I’m dumb. I’m boring. I’m no good at anything.” I remind them that if they say those things about themselves, they are being a bully to themselves just like other people are doing. So, I think that’s the part where if you choose not to believe what others say, it will show when you don’t repeat it about yourself. I think that being KIND isn’t that hard. Things like talking to the kid that you know is ignored or made fun of is a great start. Not just standing by as others say or do mean things to others. Even choosing to correct a friend who is being mean is a way of being kind to the one they are being mean to. It is humbling when kids write me to share their stories and just me taking time to respond with encouragement that they aren’t alone and that they are valued has made a huge impact. Bullying isn’t the only reason to be kind. Some kids have a hard home life and just need someone to talk to. Like in my video where verse 2 talks about the school star athlete that everyone thinks has a great life, they may not know what’s happening at home and he isn’t sharing. Sometimes being kind isn’t to the bullied, but also to people right next to you that seem to be doing fine. I know kids that get bullied because their mom or dad left the home and the kid did nothing wrong to deserve that or isn’t a target of bullying because of how they look or their race or religious beliefs. Sometimes being kind is just a choice toward everyone, no matter who they are. I know that a lot of bullies have been bullied, so even being kind to a bully can make a huge difference. Your career really started to take off over the last couple of years. Congratulations, by the way, on two back-to-back nominations for Indie Pop Artist of the Year! With all these wonderful things happening to you, does it help lessen the impact of the bullying that you deal with? I think that some of the bullying I get is normal when you do things that are different than people around you. I don’t do the same things or have the same life as most kids in my community, so it kind of makes it easy to become a target. I’ve seen more kids apologize to me for how they treated me over the years since a lot of the music stuff has been happening. So even though I still get bullied about being a singer or staying committed to purity before marriage, it’s just part of the life I’m in. I see a lot of public people get judged for their choices or what they do, so I think you have to expect that not everyone will like you and most will care enough to support you in some way. It’s like my parents have told me to not let popularity define me and also don’t let bullying define me. So bullying still hurts me sometimes depending on where it comes from, but in most cases, I just ignore it. Honestly, I don’t really see the things happening to me as something huge or unreal. I just take it one day at a time and know that it may last and it may end. Your success is an inspiration to kids everywhere. It really lets them know that no amount of bullying can take away your drive to get out there and do what you love. With so much happening at such a young age for you, how do you maintain your perspective and your ability to connect so well with other teenagers? In your experience and from your discussions with other kids who were bullied, what is the number one thing that kids can do to help prevent it from happening to other kids? 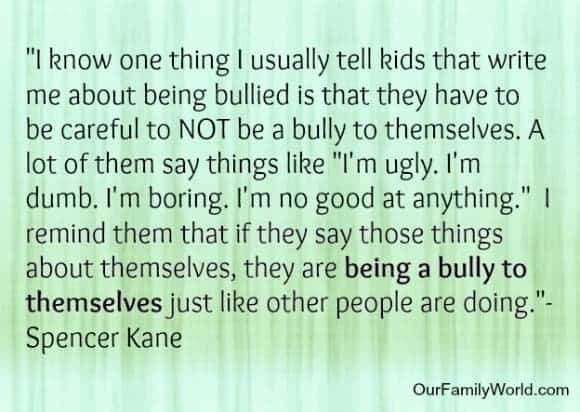 I would say that EVERY kid knows that one or two kids in their school who are bullied. Every kid knows what it feels like to be made fun of and maybe even left out of things. So it’s pretty simple. Be kind to the one or two they know are made fun of and never forget what it feels like to be made fun of. If kids just do that, it would make a difference. What advice would you give a teenager that is dealing with bullying? Most kids that write me feel like they have nobody to talk to about it. I always ask them to talk to their parents or a school counselor or a church leader. I’ve even told a couple to talk to the police if they feel it is a threatening situation. But because my parents and I talk about everything I go through, it just seems like that’s the first place they should start. I know that as a spokesman for PACER, their websites have a lot of resources for parents, teachers, and kids and teens to learn about dealing with bullying. That is something people should do for sure. What does the future hold for your music career? Do you see yourself continuing to perform into your adult years? The thing with music is that it can be a lifetime career if you are blessed to have the opportunity to become known. Even if the public part of music doesn’t last for me, I know I’ll share music with my friends and family and hopefully someday my own kids. I am a passionate sports athlete, so I am just waiting to see where God opens doors for my life the next few years. Connect with Spencer Kane on Twitter, Facebook, and YouTube. This is a wonderful interview. If more celebrities would take a stand, I think a difference could be made. They are powerful voices! Fabulous post Nicole! I have a division called @webcityTeens and we get the word out and try to help promoting positive posts specially about understanding what to do if you are being bullied so our audience can learn. Kudos! Great interview. And on such a strong and important topic such as anti-bullying! It is something that needs to be brought to light and more icons and stars to stand up against bullying. As the mom of a child who was bullied I am so happy to see celebrities speaking out about this. Dog Lovers Turned Pet Sitters: How to Get Paid to Play with Dogs!